Emma took over as shepherdess at the Earth Trust in September 2016, after making a brief appearance with her lambs at their popular lambing event back in March 2016. As well as working another part time job, Emma tends to 350 breeding ewes and a herd of Pedigree Sussex and Simmental Cattle. Despite having a first class degree in Orthotics, Emma has sheep farming in her blood as she grew up on her parents small holding. 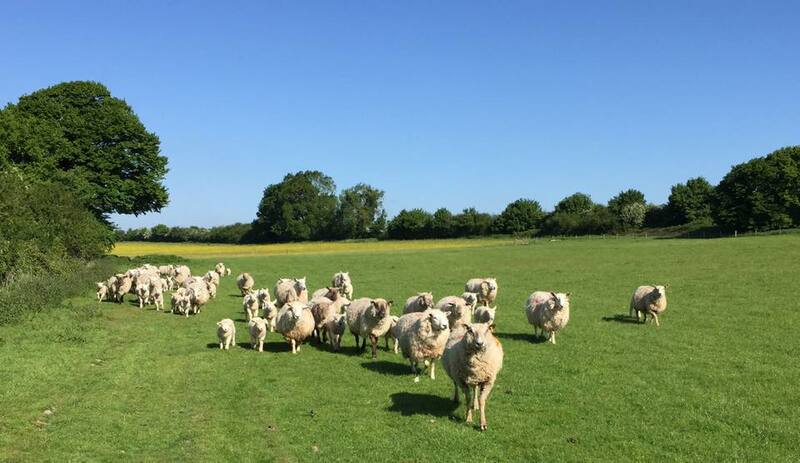 She’s always had her own sheep and when the Farm Step tenancy came up at the Earth Trust she saw it as a great opportunity to pursue her passion and grow her business. Emma’s animals graze across the wildflower meadows around the Wittenham Clumps and on the Thames Path, you’ll be able to see them if you ever take a walk that way. This means they eat a varied diet of wild flowers and native grasses. They are able to mature at a natural rate increasing their health and improving their flavour. Both the beef cattle and lambs are not fed grain so the meat is 100% grass fed and studies have shown that this increases the levels of Omega 3 fatty acids within the meat when compared to commercially grain fed animals. Also sheep are known to self-medicate, which means that if, for instance, they have an upset stomach they will graze on specific plants that help cure them. So having access to local wildflower meadows is perfect. Emma’s sheep and cattle help conserve these natural habitats by grazing the wild flower meadows at certain times of year. The cattle ensure variable sward lengths to promote different types of plant and insect life. Whereas the sheep clear the ground of all the dead vegetation once the flowers have gone to seed to ensure the seeds the best chance of germination in the next spring. Emma also uses minimal wormers and insecticides on her cattle and sheep to aid dung beetle activity and protect the natural molds & fungi in the soil to promote the whole ecosystem.